"Nani's got the potential to do what he wants. He's one of the sharpest players around, has a great strike with both feet – he's got the potential to be a top, top player." ↑ 1.0 1.1 "Nani". ManUtd.com. Manchester United. 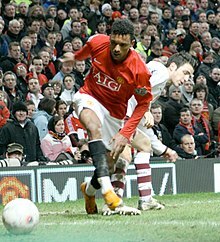 http://www.manutd.com/en/Players-And-Staff/First-Team/Nani.aspx. Retrieved on 4 دسمبر 2010. ↑ "2018 FIFA World Cup Russia™ - FIFA.com". FIFA.com. https://www.fifa.com/worldcup/players/player=254167/index.html. ↑ "Player Profile: Luís Nani". premierleague.com (Premier League). http://www.premierleague.com/en-gb/players/profile.html/luis-nani. Retrieved on 31 جولائی 2012. ↑ 6.0 6.1 "All Sports People – Nani". All Sports People. 10 جنوری 2011. http://www.allsportspeople.com/soccer/people/Nani. Retrieved on 10 جنوری 2011. ↑ "Nani". ESPN Soccernet. ESPN. http://soccernet.espn.go.com/players/stats?id=67716&cc=5739. Retrieved on 6 نومبر 2010. ↑ "Nani". Perform Group. https://int.soccerway.com/players/luas-carlos-almeida-da-cunha/4647/.